We’d love your help. Let us know what’s wrong with this preview of Mondays with Jesus 2018 by Renee Andrews. 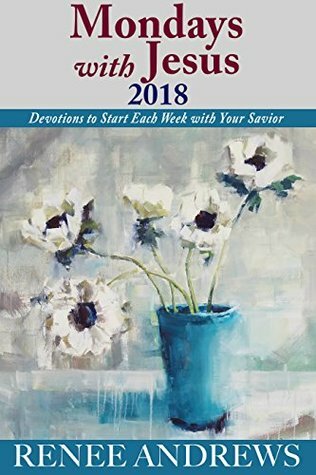 Mondays with Jesus 2018 is filled with inspiring devotionals written by National Readers' Choice Award Winner Renee Andrews. In her traditional style of applying personal experiences to God’s Word, Renee provides powerful starting points for each week that you can easily apply to your own life and your own personal walk with the Lord. To ask other readers questions about Mondays with Jesus 2018, please sign up. National Readers' Choice Award and RT Reviewers' Choice Award winner Renee Andrews spends a lot of time in the gym. No, she isn't working out. Her husband, a former All-American gymnast, co-owns ACE Cheer and Tumbling. She is thankful the talented kids at the gym don't have a problem when she brings her laptop and writes while they sweat. When she isn't writing, she's typically traveling with her National Readers' Choice Award and RT Reviewers' Choice Award winner Renee Andrews spends a lot of time in the gym. No, she isn't working out. Her husband, a former All-American gymnast, co-owns ACE Cheer and Tumbling. She is thankful the talented kids at the gym don't have a problem when she brings her laptop and writes while they sweat. When she isn't writing, she's typically traveling with her husband, bragging about their two sons and new daughters-in-law or spoiling their grandchildren. Renee is a kidney donor and actively supports organ donation. In 2013, she, her husband and their oldest son competed as team Hello Kidney on the American Bible Challenge to raise money for living donors and to raise awareness for the need for living donors.